Fall’s here, and the rain has set in. I mourn the passing of tomato season. 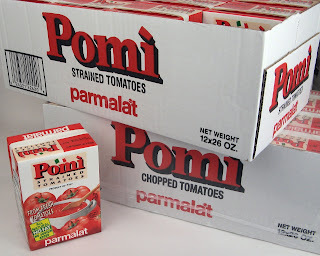 I’ve already stocked up on Pomì tomatoes. Two cases to get me through to next summer. So sweet, like a ray of sunshine, they’re the next best thing to vine-ripened, and certainly better than anything in a can. Heat a large, heavy pot over medium heat until very hot but not smoking. Add the oil and swirl to coat the bottom of the pot. Add the garlic and sauté for about a minute, or until fragrant. Add the tomatoes, water, and cream and bring to a boil. Add the orzo and basil and simmer, stirring frequently, for about half an hour, or until the orzo is al dente. Season to taste with salt and pepper. Ladle into individual bowls, top with plenty of Parmegiano, and serve immediately. Serves 6. Perfect with salad and garlic bread or grilled cheese sandwiches. If you prefer soup with a coarser texture, substitute Pomì Chopped Tomatoes for half of the strained tomatoes. You will need 2 26.455-ounce boxes of Pomì tomatoes for this soup. They’re available at most fine grocery stores. yum! 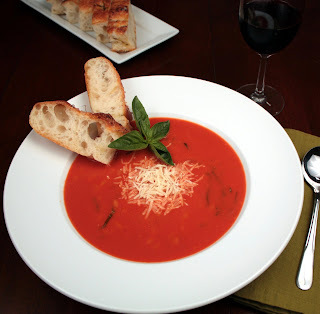 this looks great :) i love orzo, and tomato soup! !